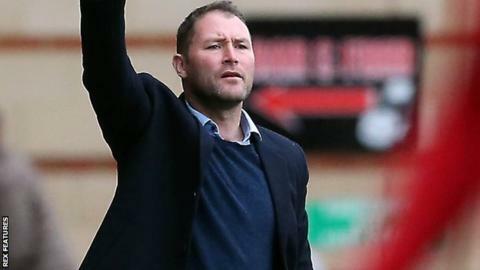 Havant & Waterlooville manager Lee Bradbury is confident calls for new and additional investment are the right step for the National League club. Havant are in their first season in the division and chairman Derek Pope has made an appeal to interested parties. Pope has also reassured supporters the Hampshire club is not for sale. "Derek knows what's good for the club and to make it competitive at this level," Bradbury told BBC Radio Solent. "He knows what we're up against." There was initial confusion last week when an advert appeared in business publication Daltons Weekly which suggested the club, promoted as National League South champions last season, was for sale. However, the Hawks board said in a statement that new investment was needed to keep the club "debt free" and fund proposed ground improvements. "You come up against a lot of big budgets in this league," former Portsmouth and Manchester City striker Bradbury added. "Every team has got a limit. "Derek has put a lot of heart and soul and money into this club. He realises he needs a little bit of help for us to be competitive." Havant & Waterlooville are currently fourth from bottom in the National League, a point adrift of safety with 11 games remaining. They intend to go full-time whichever division they are playing in next season.